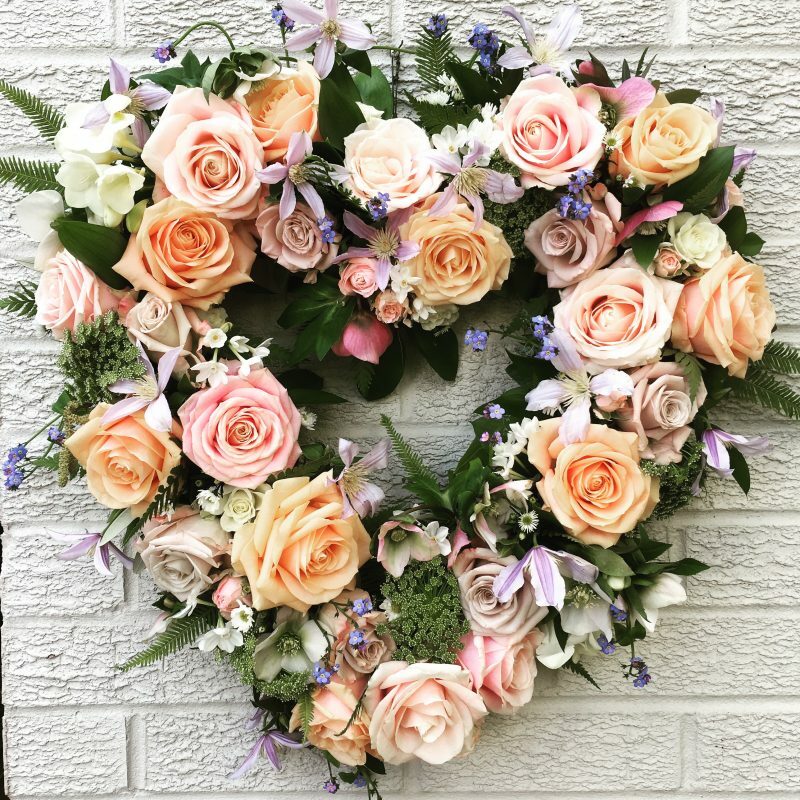 If you’ve been mooching around Pinterest or Instagram looking for ideas for your wedding flowers, you won’t have missed all the gorgeous hanging flowers. It’s such a fabulous way to create an instant wow factor and massive visual impact that it’s not surprising so many couples are asking for them now. 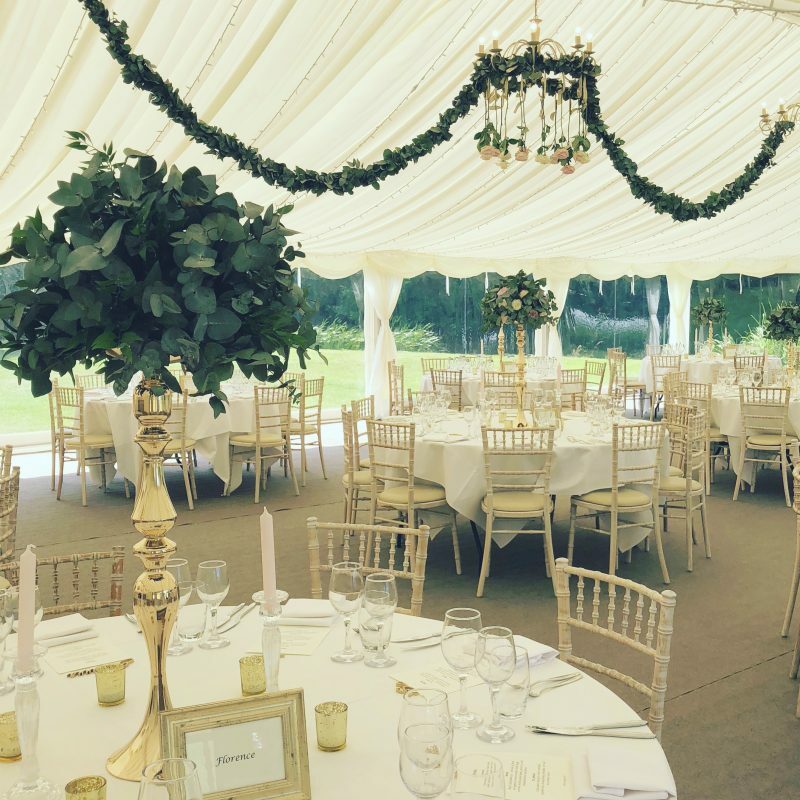 The Foxgloves and Roses team has created a fair few of them, each of them completely bespoke, so that they suit both the couple’s style and the venue itself. Here are some of them. Which do you like the most? 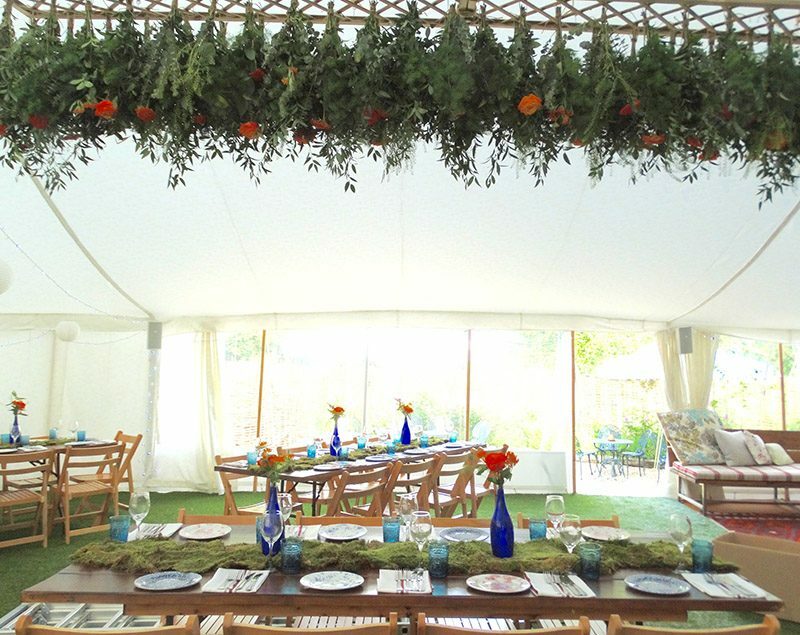 Created for an boho-style summer party at The Perch in Binsey, Oxford, this upside-down hanging flower creation really set the scene for the occasion. The picture below goes to show just how different a wedding venue can look depending on how it is decorated. It’s of another hanging flower installation at The Perch. 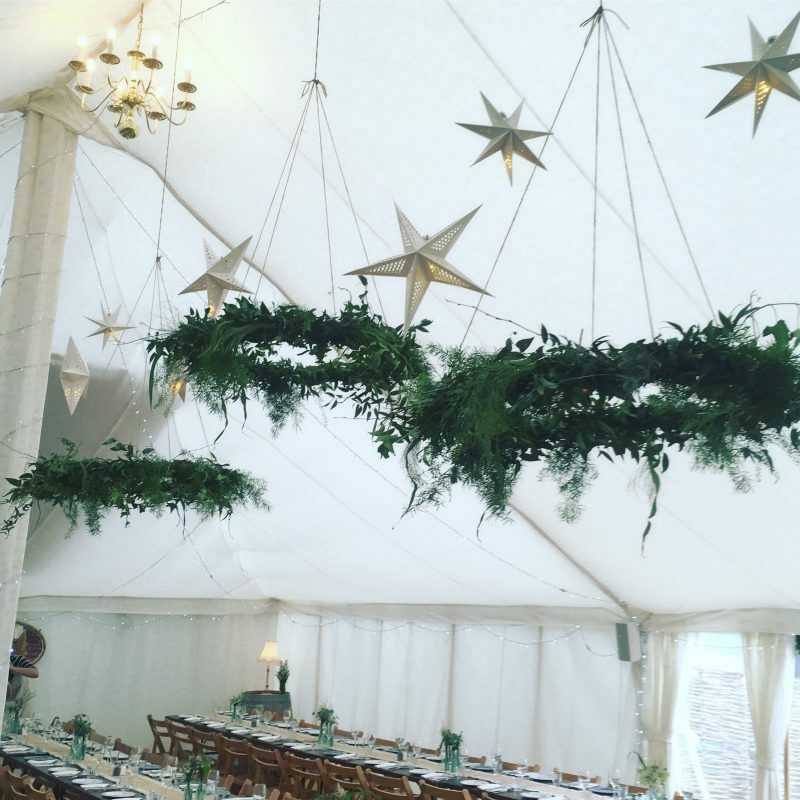 This time the theme was ‘A Midsummer Night’s Dream’ and the installation in based on hoops of foliage and gorgeous white paper star lanterns. 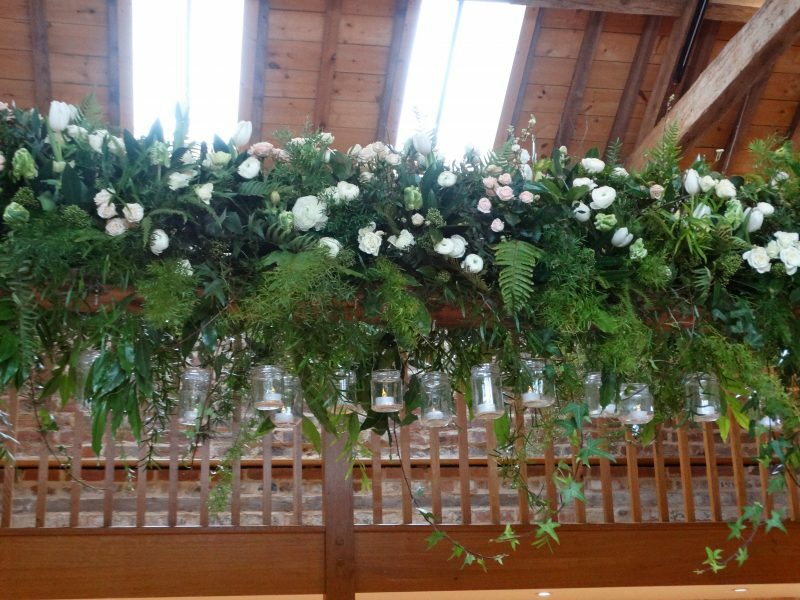 For a winter wedding reception in a private barn we created a stunning three metre long hanging flower installation with white and blush flowers and trailing winter greenery. Along the underside we hung jam jars with candles so that in the evening there would be little twinkles of light. 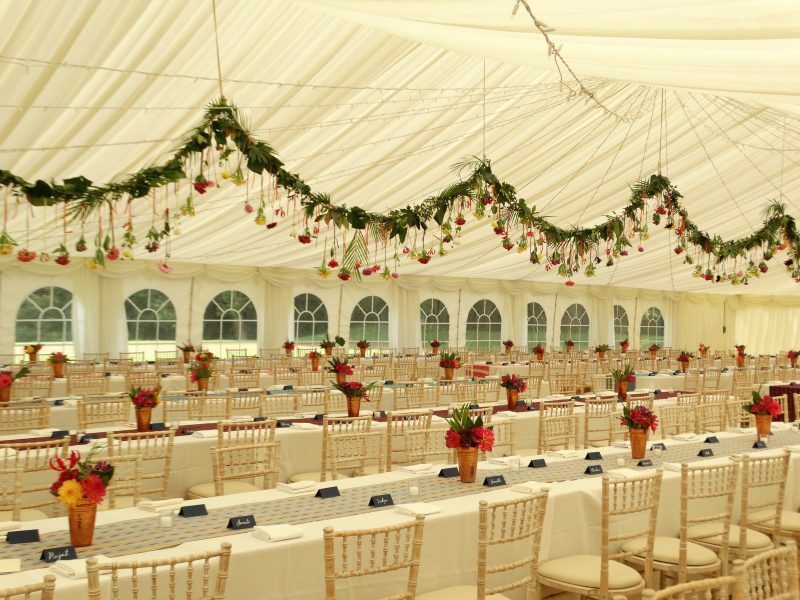 For an Anglo-Indian wedding at Rousham House, with a colourful, tropical theme, we created a fabulous 20 metre long hanging rope of flowers. The rope was covered in tropical leaves and bright flowers hung from colourful ribbon. It truly was a show-stopper! Hanging globes are another take on the hanging flowers concept. This one was created for a wedding with a wild hedgerow theme. It made it’s first appearance outside the Church and then made an encore suspended above the tables in the marquee. 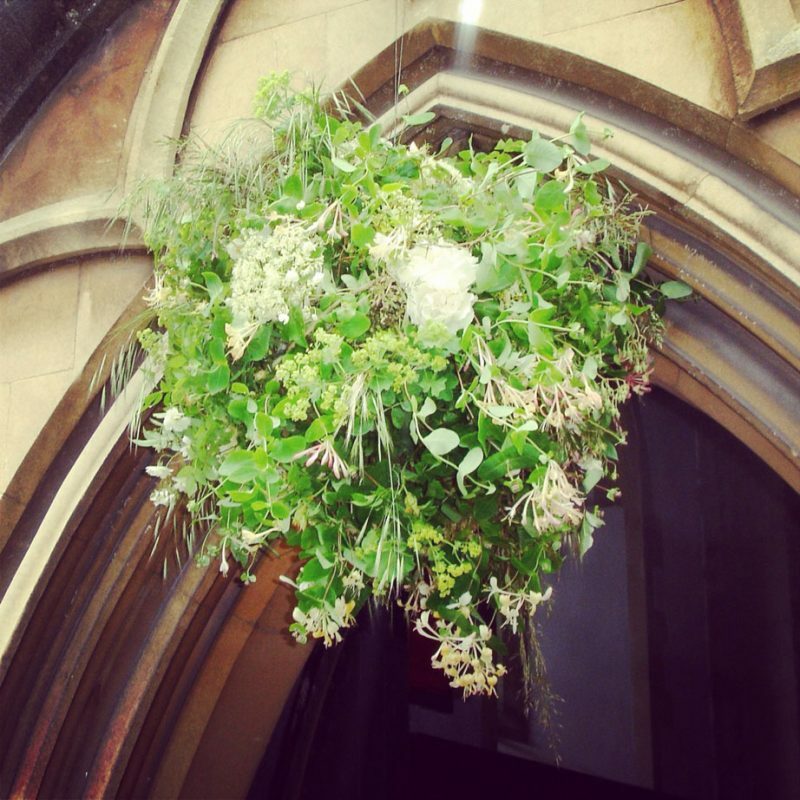 Sometimes it’s possible to create hanging flowers by make floral additions the chandeliers and this is something we often do for weddings at Ardington House. Hanging flowers are such a modern, different and creative way to incorporate flowers into wedding styling. You’re only limited by your imagination and your florists’ head for heights! The colour scheme you chose for your wedding will set the scene for the entire day. Not to mention that it will be immortalised forever in all your wedding photographs. So no pressure there then. Here are my seven expert tips for getting it right. Number one: The flowers. 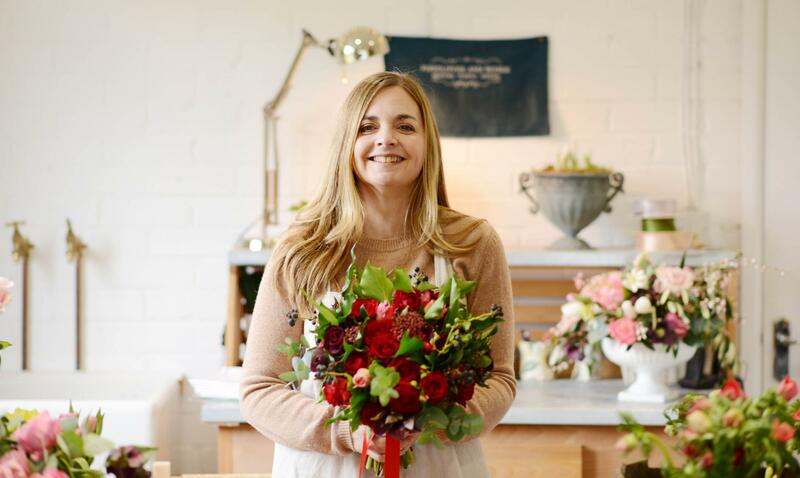 If you have your heart set on a favourite flower like blue nigella, coral peonies or yellow sunflowers, use them as a starting point for putting together your wedding colour palette. It doesn’t have to be the dominant colour in your palette, maybe use it as an accent colour, the key thing is not to choose something like the bridesmaids’ dresses and then realise it doesn’t work with the colour of your favourite bloom. Number two: The venue. This is a big one. Don’t decide your wedding colour scheme without considering your venue. If there’s a distinctive colour in the decor, play to it, don’t try to compete with it. If it’s a dark venue with panelled wood walls or soft lighting, dark coloured flowers will recede – although that can totally work if you are trying to create an opulent, dramatic look. Take a look at the curtains, carpets and walls – is there anything there that will clash with or swamp your colour palette? Is there anything there you can use for inspiration? If your wedding reception is going to be in a marquee, avoid all-white flower arrangements (unless there’s plenty of green too) because they’ll merge into the background. If you’re getting married when your venue’s Christmas decorations are going to be up, it’s a good idea to ask what they’re planning and what colours they will be. Number three: The mood. Think about the mood you’re trying to create for your wedding and then use the colour palette to paint the scene for you. Is it lavish and intimate (dark jewel colours)? Is it joyful and informal (bright colours)? Is it romantic and chic (soft blush shades)? Number four: The season. You could decide to be in tune with the time of the year that you’re getting wed. If it’s in the autumn, plum and berry tones are fabulous. If it’s spring, you may be inspired by the colours of tulips. If your wedding day is in the winter, perhaps silvery frosts or deep, warm, rich colours will be your starting point. Number five: The clothes. If your Groom planning on wearing the family tartan and it’s green and yellow, bear that in mind before you set your heart on a pastel colour scheme. And remember to consider your Bridesmaids’ colouring before you pick out a dress colour that doesn’t suit them. Everyone needs to look lovely in the photographs (and feel happy in what they are wearing). Number six: Look to what you love. Colour fashions are great for inspiration, but like all fashions they come and go. As always, it’s best to chose something that you love and that you feel is your own. Take a look at your favourite clothes, and remind yourself, what colours do I love to wear? What colours have I painted my walls? What colours make me feel good? Number seven: Get some help. 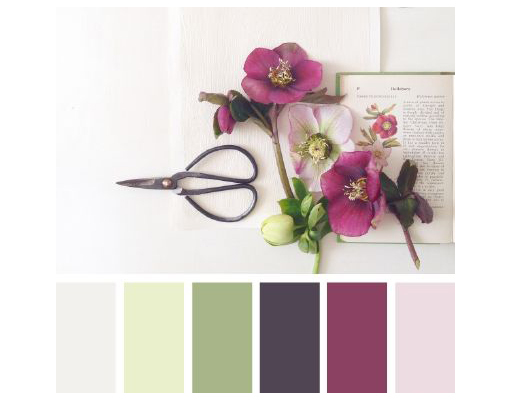 Call on the experience of your floral designer or wedding planner to help you decide on your perfect colour palette. We’re full of inspiration that can help create a look that’s perfect for you and suggest colour combinations and contrasts that you may not have thought of.